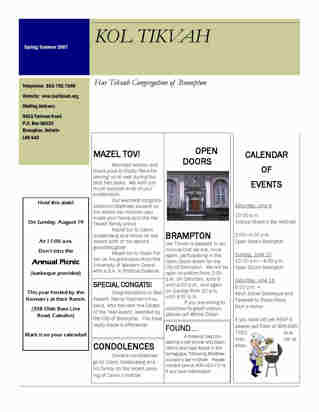 In addition to being the spiritual leader at Har Tikvah, Rabbi Michal Shekel is the Executive Director of the Toronto Board of Rabbis, the Rabbinic Director of the Reform Beit Din and Jewish Information class, and is the mesaderet gittin (divorce officiant) for the Reform Rabbis of Greater Toronto Beit Din. She also teaches adult classes in Toronto covering a variety of Jewish topics and leads a monthly Torah study group. Rabbi Shekel is the original co-editor of the holiday section of myjewishlearning.com. She also spent four years writing the weekly on-line Torah study for Kolel. She is the author of numerous textbooks used in Jewish schools throughout North America and has contributed articles to a variety of Jewish publications. She is currently a regular contributor to the Parashat HaShavuah column in the Canadian Jewish News. Over the course of her career, Rabbi Shekel has served as a board member of the Central Conference of American Rabbis and as the Chairperson of the Reform Rabbis of Greater Toronto. She has also been on the boards of organizations dealing with Jewish continuity and education, outreach, interfaith issues, inclusion, racism, and drug and substance abuse.